Judy Gula of Artistic Artifacts has been sewing on BERNINAs for years, and is now delighted to be an authorized BERNINA dealer! Visit us at 4750 Eisenhower Avenue, Alexandria, VA or email us to learn more about purchasing a new machine, servicing your current model, and our mastery classes. • Enjoy 0% Interest for 48 months on BERNINA purchases of $3,000 or more made with your BERNINA Credit Card! Complete terms and conditions: Offer applies only to single-receipt qualifying purchases. No interest will be charged on promo purchase and equal monthly payments are required equal to initial promo purchase amount divided equally by the number of months in the promo period until promo is paid in full. The equal monthly payment will be rounded to the next highest whole dollar and may be higher than the minimum monthly payment that would be required if the purchase was a non-promotional purchase. Regular account terms apply to non-promotional purchases. For new accounts: Purchase APR is 29.99%; Minimum Interest Charge is $2. Existing cardholders should see their credit card agreement for their applicable terms. Subject to credit approval. See store for details. Participating Dealers Only. • Save up to $2,000 off MSRP on our BERNINA Sewing, Embroidery, Overlockers and Quilting machines! Not valid on previous purchase or with any other offers or coupons. Some exclusions may apply. Available while supplies last. Taxes not included in total purchase calculation. Customer is responsible for all applicable sales tax. • $2,000 off BERNINA Q Series Longarm Machines! 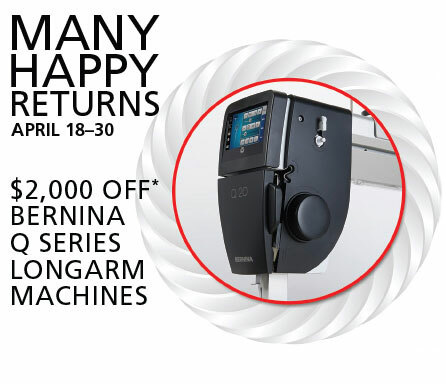 Offer valid April 18–3-, 2019 at any participating US BERNINA Longarm Store.Offer applies to the purchase of BERNINA Q20, Q24 machines only. One discount per customer. Savings discount will be applied at time of purchase. Not valid on previous purchases or with any other savings offers or coupons. Some exclusions may apply. Subject to availability. Available while supplies last. Taxes are not included in the total purchase calculation. Customer is responsible for all applicable sales tax. If customer returns the product(s) purchase discount will be lost. Cannot be redeemed for cash. With the BERNINA Q 20 Sit-Down Longarm Machine, free-motion quilting is child’s play. The generous long arm depth and height provide ample space for managing your larger quilts. It features a 20 in. throat space for big quilt projects; unique digital thread tension adjustment; easy threading, independent bobbin winder and stitch regulation for perfect stitches. And with high-speed precision stitching up to 2,200 stitches per minute, you will complete more quilts quicker than ever. The BERNINA Q 20 comes standard as a sit-down model machine — the elegant Koala table is designed to handle the speed and weight of the Q 20 with ease for optimal performance. 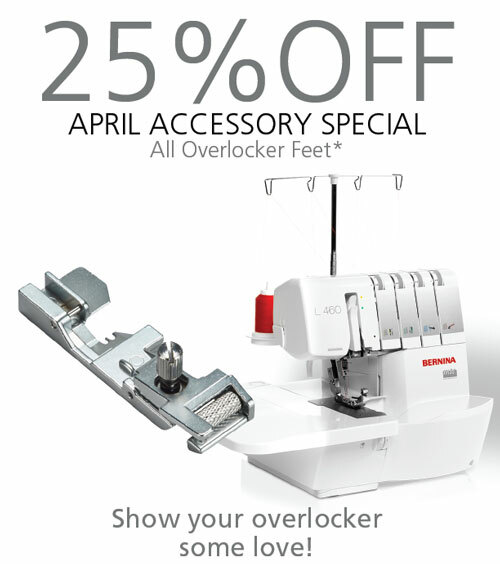 The April 2019 featured accessory, available at 25% off*, is your choice of Overlocker Feet! Perfect overlock stitches are just a foot away with these presser feet for special applications! Easily gather and create elastic bands; Sew piping, strands of beads or sequins; Chain stitch and cover stitch foot and more — show your overlocker some love! 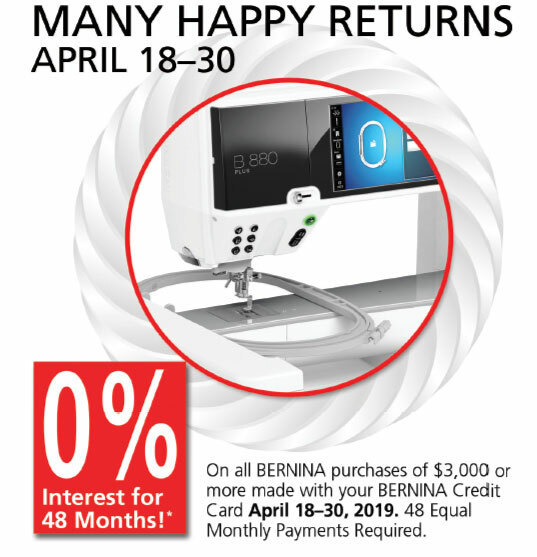 *Offer valid April 1-30, 2019 at any participating BERNINA Store. Offer good for 25% off all Overlocker Feet. Cannot be replaced with any other offer. Not valid on previous purchases. Taxes are not included in the total purchase calculation. Cannot be redeemed for cash. Some exclusions may apply. Subject to availability. Available while supplies last. Offer limited to the residents of the 50 United States only. Book a shopping appointment with us or stop by Artistic Artifacts to test-drive your new machine! We are proud to be one of the more than 2,000 BERNINA Stores worldwide to help you with advice on machines and accessories that best suit your needs, selection of BERNINA Embroidery Software and also in servicing your BERNINA. When it’s time for your next machine embroidery project choose embroidery designs, stabilizers and other supplies from the Artistic Artifacts Embroidery Design Studio! OESD joined the BERNINA family of sewing and embroidery products in 1997. An innovator of embroidery techniques and styles, you will find button-and-loop free standing lace, in the hoop projects, jumbo designs, cutwork, reverse applique, quilting and many more fun and exciting ways to use your embroidery machine. OESD digitizers carefully work to reduce embroidery thread changes, eliminate thread traps, and test sew every single machine embroidery design created in their studio. Visit our classes page for information on machine embroidery classes and clubs! BERNINA, a family-owned business, focuses on long-term performance and continuous innovation, with special emphasis on quality, performance, technology, design and service. They have been manufacturing sewing machines for more than 120 years! Every BERNINA model offers you tradition and precision wrapped in aesthetic perfection. A host of features for premium-quality sewing, embroidering, and quilting — that’s what the name BERNINA stands for. BERNINA machines are only sold through their dealership network, which ensures that you will get the best after-purchase support and education available. We look forward to serving you!